So Many Ancestors, So Little Time . . . . 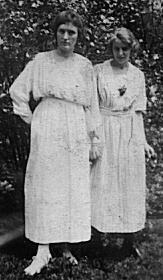 This picture is of Nora (Barrett) Dotson of Pikeville, Kentucky and her sister-in-law Rita posing in a Garden. Our family has a stack of old photos, but this is among the few for which our forebearers have left a record identifying the people who posed for the pictures. Pike County is Kentucky's largest, a mountainous county on Kentucky's eastern edge with coal resources and a local college which serves the needs of many in the area. It was formed from Floyd County. ALLEY - Peter H. Alley was born in 1826 in Pike County, Kentucky. His father was Paul Alley, born 1798 in the Clinch River Valley of Virginia, and Rebecca WILLIAMSON, b. 1805. Rebecca, daughter of Benjamin Williamson and his wife Lucretia Scott, lived near the Kentucky-West Virginia border. The story of her grandfather, Alden Williamson, will be featured on the unusual ancestors page. Paul was the son of Peter Alley, Sr., b. 1759, and Jane HUNDLEY, b. 1767, the grandson of James Alley,Sr., b. 1728 in Henrico Co., Va. and the great grandson of Thomas Alley. James Alley will be featured on the unusual ancestors page. BARRETT - Isaac Charles Barrett was born in 1857, in Tazewell County, Virginia. Isaac was the son of John Thomas Barrett, born 1833, in Tazewell County, and his wife Catherine BEAVERS. John T. Barrett's parents were Robert Barrett, b. 1803, the son of Thomas Barrett and Mary McINTOSH and Margaret MAXWELL, b. 1798, the daughter of James Maxwell and Mary WITTEN, whose grandfather Thomas Witten had been an early settler in the Tazewell area. James Maxwell's own grandfather, the elder James Maxwell was a brave and hardy pioneer; we may put some data about him on the site. The wife of John Thomas Barrett also had an interesting family - Catherine Beavers had as parents William Beavers and Nancy HARRISON. William's parents were Robert (Robin) Beavers and Catherine HARMAN, daughter of Matthias Harman, whose biography may be found on the unusual ancestors page. Nancy was the child of Alexander Harrison and Malvina HARMAN of another branch of the large German family. Isaac Charles Barrett married Harriet WALKER, daughter of William P. WALKER and Margaret M. STEELE. The story of her family will be found elsewhere on the site when construction is completed. BEAVERS - William Beavers of Tazewell County Virginia, son of Robert "Robin" Beavers and Catherine HARMAN, married Nancy HARRISON, daughter of Alexander Harrison and Malvina Harman (Henry Harman's daughter). Catherine's mother was Lydia SKAGGS, daughter of James Skaggs, one of the longhunters who made trips into Kentucky when it was a wilderness. Her father, a famous fighter, Matthias HARMAN, will be featured on the "Unusual ancestors" Page. William Beavers and Nancy Harrison, had a daughter, Catherine Beavers who married John Thomas BARRETT, b. 1833 in Tazewell Co., Va. Some of their children and grandchildren would eventually emigrate to Kentucky, traveling by covered wagon to take jobs in the lumber industry. CARTERS - Frances Carter, b. 1826 in Bath County, Kentucky was the mother of Lillie Carter Henry, b. 1880, Ezel (Morgan Co.) Kentucky. Frances, who married Michael HENRY, was the daughter of Elijah Carter, b. 1799 in Buckingham Co., Va.; Elijah's parents were Joseph Carter and Magdalin CHASTAIN. The mother of Frances was Eliza RAGLAND, the daughter of James Ragland and Rhoda Chastain. CASSADY - William Cassady, b. 1835 in Lawrence Co., Kentucky, married Tamsey MOORE, b. about 1838-1839, daughter of Samuel Moore and Thursy HARDIN. William was the son of Benjamin Cassady, b. 1800 in Virginia, one of the early residents of what is now Martin County, Kentucky. William was the grandson of Thomas Cassady, Revolutionary War Soldier and spouse of Mary Corder). Thomas came to Kentucky from Tazewell County, Virginia. William's Uncle Phillip will be featured on the unusual ancestors page. William's mother, Juliet HELVEY, born around 1805, was the daughter of Jacob Helvey and Susannah HALL. The name Helvey was changed by Jacob's father Adam from the German Helwig to Helvey. Susannah's parents were William Hall, b. around the mid- 1740s in Culpepper Co., Va. and Mary Grayson, also from Culpepper, daughter of John Grayson. The Halls moved from Culpepper to Tazewell County, Virginia, an early pioneer settlement on the "western" frontier.